Gator Cases is proud to announce that its popular Transit Series Line now has matching accessory bags. The perfect add-on to the Transit Series Gig Bag lineup or even just on their own, these bags deliver. 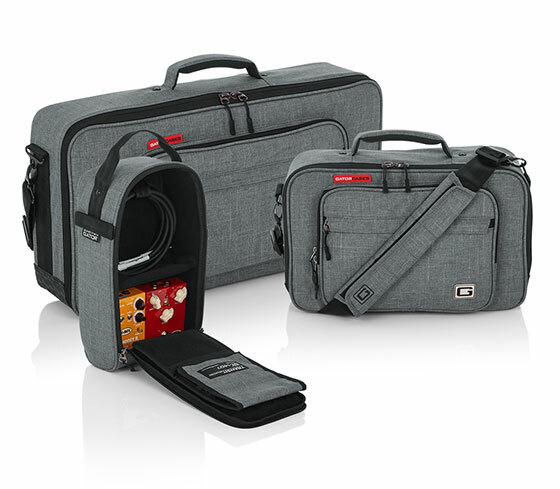 The GT-1610-GRY and GT-2412-GRY are both extremely spacious, carry-on bags ideal for multi-fx pedals, midi controllers, drum machines, photo equipment, and more. Not only are these bags stylish, they are very practical and will keep you organised at home or on the go! They also happen to be a perfect fit for the Gator BAK and LAK Aluminium Pedal Board Series. Of course, all of the Transit Series bags provide the high quality and protection that you expect from Gator and include a rigid foam interior and adjustable internal padded dividers. The padded comfort handles and removable, adjustable shoulder straps allow you to choose how you wish to carry. Gator Cases are distributed in the UK and ROI by Sound Technology Ltd. For more information please call 01462 480000 or visit https://www.soundtech.co.uk/music-retail/gator.